The eMC18 „Umicore EvoLoup“ is our ninth and most recent car. As the second car of the “new era” we concentrated on developing parts that had not worked in the year before. As a result, it features many parts of its predecessor the eMC17 “Umicore Loup”. Nevertheless, the eMC18 was a big step forward. We are very excited to see how it will perform this summer when we visit FSG, FSS and for the first time ever FSN. With the eMC17 “Umicore Loup“ we changed the vehicle concept drastically. The eMC17 was the first vehicle in our history to follow an all-wheel driven concept. In addition to that we reworked the aero package entirely. Because the accumulator container of its predecessor burned down, we decided to integrate an innovative fire extinguishing system into it. 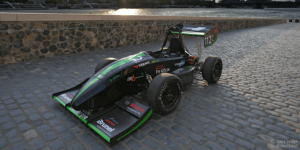 It competed in the Formula Student Germany as well as the Formula Student Spain. The eMC16 “elina“ was an evolution of its predecessor the eMC15. Many parts were directly inherited from it to simplify maintenance. In January 2017 we attempted to break the „world indoor speed record“ with it. However, we came up short by 7 kph. 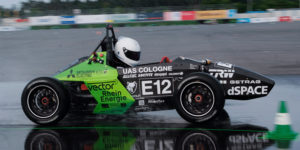 The eMC16 participated in Formula Student Germany and Formula SAE Italy. A trip to Formula Student Spain was planned but the accumulator container burned down before it. The eMC15 was the first car in our history to feature a full aero package. 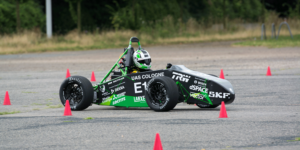 The eMC15 competed at Formula Student UK, Formula Student Germany and Formula Student Spain. After a crash in Spain during acceleration we had to repair major parts of the car. With the help of many other teams we managed to fix everything until the end of the day and were able to complete the endurance the next day. As a result, we won the best teamwork award. 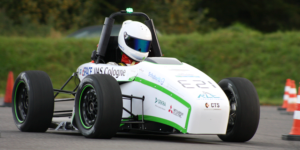 The eMC14 was the only car we ever built that did not compete during the Formula Student Germany in Hockenheim. Nonetheless we had a quite good result in Italy with where we finished Top 10 in all of the dynamic disciplines and even secured a 3rd place in autocross. To save weight we used a ultrathin layer of cover for the steel space frame which is also used in aviation. The eMC13 is still our most successful car. The basic idea behind its design was recyclability and sustainability. Instead of a carbon monocoque we built a recyclable steel space frame. 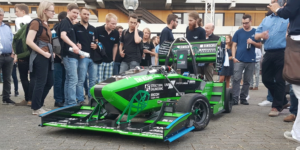 With the eMC13 we competed at the Formula Student Germany and Formula Student Spain during both of which we were able to score 2nd places during dynamic events: efficiency and autocross in Germany and Spain respectively. The eMC12 was our first car to compete in the home of British motorsport – and the home of Formula Student in Europe – Silverstone. Additionally, the eMC12 visited the pits of Hockenheim and Barcelona at the FSG and FSS respectively. It featured a hybrid chassis and our first carbon-aramid battery box housing. Today the eMC12 is still valuable to us as it greets the students of the TH regularly. The eMC11 had the first full carbon monocoque we ever built. As a result, we broke the 300 kg barrier for the first and last time in our history. Being an evolution of the eMC10 it also had a top speed of around 100 kph. 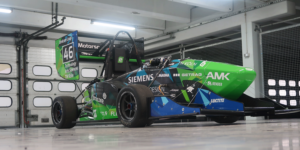 With the eMC11 we competed at Formula Student Germany as well as Formula Student Spain. Today it is the base for many project and bachelor thesis’s. 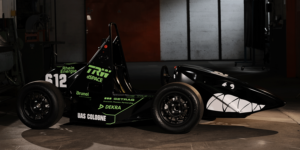 The eMC10 was the first full electric Formula Student race car that was ever built in Cologne. It was based on the last combustion car our predecessors Formula Racing Cologne had done. 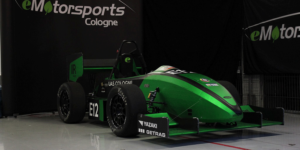 With it a new era of Formula Student arrived here in Cologne. 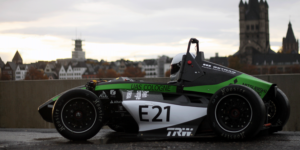 It competed at the first ever Formula Student Electric in Hockenheim and the FSS in Barcelona, Spain.